The insignia used by US generals and admirals of OF-10 rank. A five-star rank is a very senior military rank, first established in the United States in 1944, with a five-star insignia, and corresponding ranks in other countries. The rank is that of the most senior operational military commanders, and within NATO's "standard rank scale" it is designated by the code OF-10. Not all armed forces have such a rank, and in those that do the actual insignia of the "five-star ranks" may not contain five stars. For example: the insignia for the French OF-10 rank maréchal de France contains 7 stars; the insignia for the Portuguese marechal contains four gold stars; and many of the insignia of the ranks in Commonwealth of Nations contain no stars at all. Typically, five-star officers hold the rank of general of the army, admiral of the fleet, field marshal, marshal of the air force, general of the air force, and several other similarly named ranks. Five-star ranks are extremely senior - usually the highest ranks. As an active rank, the position exists only in a minority of countries and is usually held by only a very few officers during wartime. In times of peace, it is usually held only as an honorary rank. Despite the rarity and seniority of five-star officers, even more senior ranks have been adopted in the United States, namely, admiral of the navy and general of the armies. Other names for highly senior ranks from the twentieth century include généralissime (France), generalisimo (Spain) and generalissimus (USSR). Only one Australian born officer (Sir Thomas Blamey) has held a substantive Australian five-star rank (field marshal). [nb 2] HM King George VI and HRH Prince Philip, Duke of Edinburgh have held all three Australian five-star ranks in an honorary capacity, and have been the only holders of the Australian ranks of admiral of the fleet and marshal of the RAAF. Five-star ranks in Brazil are only used in wartime. Stožerni general (lit. "staff general", usually translated as general of the army) awarded to six men, none of whom are in active duty. Admiral flote (admiral of the fleet). The rank was called stožerni admiral (lit. "staff admiral") until 1999; only Sveto Letica was awarded this rank – in March 1996, three months before his retirement. Flag used on the official car of Marshal of the Air Force in India. It has five stars on it. Around 1998, the Indian Air Force introduced gorget patches (or collar tabs) for its air officers. For marshals of the Indian Air Force, the patches display five stars. Jenderal besar (grand general) - only held by three people. Marshal of Poland (Marszałek Polski) is a Polish Army five-star rank. There are today no living marshals of Poland, since this rank is bestowed only on military commanders who have achieved victory in war. These ranks have been reserved for the reigning monarch. The monarch of Thailand is appointed to the three ranks automatically upon accession as he is the constitutional Head of the Royal Thai Armed Forces. Since 1973 the three ranks have been reserved for members of the royal family. 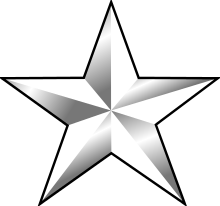 The worn insignia of British five-star commanders do not contain stars; the vehicle star plate, mounted on the front of a staff car, does display five stars. Promotion to the ranks of admiral of the fleet and marshal of the Royal Air Force is now generally held in abeyance in peacetime with exceptions for special circumstances. Promotion to the rank of field marshal was generally stopped in 1995 as a cost-cutting measure but is still made in some cases. The most recent appointments to five-star ranks are the promotions in 2012 of The Prince of Wales to honorary five-star rank in all three services, and of former Chief of the Defence Staff Lord Guthrie of Craigiebank to the honorary rank of field marshal. In 2014 the former Chief of the Defence Staff Lord Stirrup was promoted to the honorary rank of marshal of the RAF. During World War II and (later) serving NATO, a small number of British five-star commanders have held the additional title Supreme Allied Commander, given operational control over all air, land, and sea units led by the four-star commanders of multi-national forces. 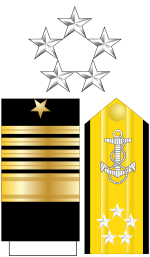 Before the five-star ranks were established in 1944, two officers had previously been promoted from their four-star ranks to the superior and unique ranks of Admiral of the Navy and General of the Armies: Admiral George Dewey (appointment 1903 retroactive to 1899, died 1917) and General John J. Pershing (appointed 1919, died 1948). In 1944 the Navy and Army specified that these officers were considered senior to any officers promoted to the five-star ranks within their services (but it was not clear if they were senior by rank or by seniority due to an earlier date of rank). Five-star ranks were created in the US military during World War II because of the awkward situation created when some American senior commanders were placed in positions commanding allied officers of higher rank. US officers holding five-star rank never retire; they draw full active duty pay for life. The five-star ranks were retired in 1981 on the death of General of the Army Omar Bradley. During World War II and (later) serving NATO, a small number of American five-star commanders have held the additional title Supreme Allied Commander, given operational control over all air, land, and sea units led by the four-star commanders of multi-national forces. Rank insignia for a General of the Army from September 1959 to October 2014. 1 2 3 The Australian insignia for admiral of the fleet, field marshal and marshal of the Royal Australian Air Force, depending on the era, are either identical to, or very similar to, the British insignia. Currently, Prince Philip is the only holder of these Australian ranks. Note that although the highest active New Zealand rank is three-star, (there are no New Zealand four-star rank holders), Prince Philip holds five-star ranks in the New Zealand Armed Forces. ↑ With the exception of Thomas Blamey and the Englishman William Birdwood, who both held the rank of field marshal, all other holders of Australian five-star ranks have been ceremonial. The timing of the first seven appointments was to establish both a clear order of seniority and a near-equivalence between the Army and Navy services. In 1949, Arnold was honored by being made the first, and to date only, general of the air force. He is the only American to serve in a five-star rank in two of its military services. By a Congressional Act of 24 March 1903, Admiral George Dewey's rank was established as admiral of the navy, a rank which was specified to be senior to the four-star rank of admiral and was equal to admiral of the fleet in the British Royal Navy. Admiral Dewey was the only individual ever appointed to this rank, which lapsed with his death on 16 January 1917. Admiral of the navy was considered superior to fleet admiral during World War II. On 3 September 1919, John Pershing was promoted to the rank of general of the armies (officially general of the armies of the United States) in recognition of his service during World War I. He is the only person promoted to this rank during their lifetime. ^a During the United States Bicentennial year, George Washington was posthumously appointed to the grade of General of the Armies of the United States by the congressional joint resolution Public Law 94-479 passed on 19 January 1976, with an effective appointment date of 4 July 1976 but having rank and precedence over all other grades of the Army, past or present. This restored Washington's position as the most senior US military officer. Between the joint resolution concerning Washington's rank, the fact that Omar Bradley was still alive, and thus still considered to be on active duty, and statements made and actions taken during and after World War II about the relationship between General of the Armies and General of the Army, it appears General of the Armies is superior in rank to General of the Army. ↑ Oxford English Dictionary (OED), 2nd Edition, 1989. "five" ... "five-star adj., ... (b) U.S., applied to a general or admiral whose badge of rank includes five stars;"
↑ Heathcote, Tony (1999). The British Field Marshals, 1736–1997: A Biographical Dictionary. Barnsley: Pen and Sword Books. ISBN 978-0-85052-696-7. 1 2 "Prince Charles awarded highest military ranks by Queen". BBC News. 15 June 2012. Retrieved 17 June 2012. ↑ "Honorary Five Star Rank appointment". The British Monarchy. 16 June 2012. Retrieved 22 June 2012. 1 2 E. Kelly Taylor (2009). America's Army and the Language of Grunts: Understanding the Army Lingo Legacy. AuthorHouse. p. 283. ISBN 978-1-4389-6249-8.